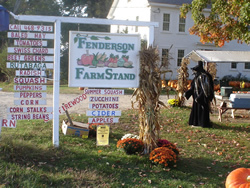 Fenderson Farms, run by John and Linda Fenderson, open 7 days a week, 9 AM to 5 PM starting July 1st to October 31st. We grow in-season vegetables including corn, cucumbers, blueberries, blackberries and tomatoes. We focus on using a minimum amount of pesticides. We sell Christmas trees as well after Thanksgiving. We are at Kennebunk farmers market. We have a farm stand in the summer at Ocean Park. A wide variety of seasonal vegetables, including the best corn, always picked within 24 hours of selling.